A ‘Family Guide’ brochure is also available at check-in. It contains tips and information for parents about the location of airport play areas, baby changing facilities, restaurants that provide children’s menus, chemists, supermarkets and the nearest observation deck, as well as vouchers for special offers at the airport. The Family Check-in desks can be easily recognized because of a large welcome arch, while the path to the counters looks like a runway and overhead monitors display the airline’s kid mascots Lu and Cosmo. 9 November 2012 | Getting up on time can be a challenge, but numerous variations on the alarm clock theme are aiming to make it easier. Now a mobile app launched earlier this year by Lufthansa adds a different twist altogether. Specifically, users of Lufthansa’s free Anywake app are awoken to the sounds of a random city — if they guess which one it is, they’re rewarded with discounted tickets to that destination. After downloading the app — which was created for Germany-based Lufthansa by ad agency DDB Stockholm and Monterosa — users begin by selecting a standard wake-up sound, which will then wake them up each day. Every other morning or so, the app will wake the user to the sounds of a randomly selected city instead. To turn off the alarm, they must guess which city it is — if they’re right, they get rewarded with a discount for airfare to that city. This video explains the premise in more detail. 19 January 2011 | In third place is Lufthansa, which through its acquisition of SWISS, Austrian, British Midland and Brussels Airlines has aggressively led consolidation in the European airline industry. The German flag carrier has also started a new subsidiary in Italy, and is reportedly also interested in SAS and Polish carrier LOT. Serving various market segments with products ranging from low-cost Germanwings to high-end Lufthansa Private Jet, Lufthansa is a strong brand associated with quality, thoroughness and innovation by many travellers, resulting in an above-average share of high-yield premium traffic. However, the airline’s high cost base and decentralized home market makes it vulnerable to competition from low-cost airlines such as airberlin and carriers from the Gulf Region such as Emirates. With the introduction of its first A380 in May 2010, Lufthansa has started a complete revamp of all classes across its entire fleet, spending as much as EUR400 million through 2013. The airline’s A380 is the first aircraft to feature Lufthansa’s new First Class, which according to the airline has ”the quietest First Class ever,” with sound-absorbing curtains and carpet and special sound-insulating material in the aircraft’s outer skin blocking noise. 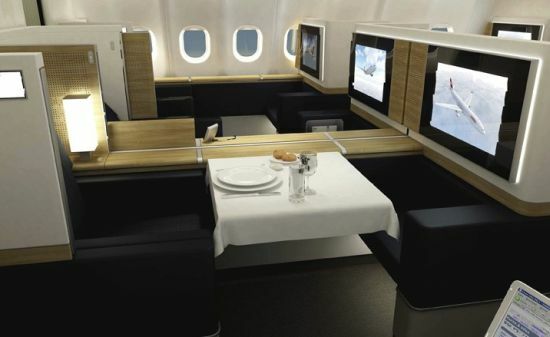 Lufthansa has avoided the fully enclosed First Class suites offered by Singapore Airlines and Emirates saying that at numerous in-flight tests and surveys, passengers expressed a clear preference for an open-plan design. 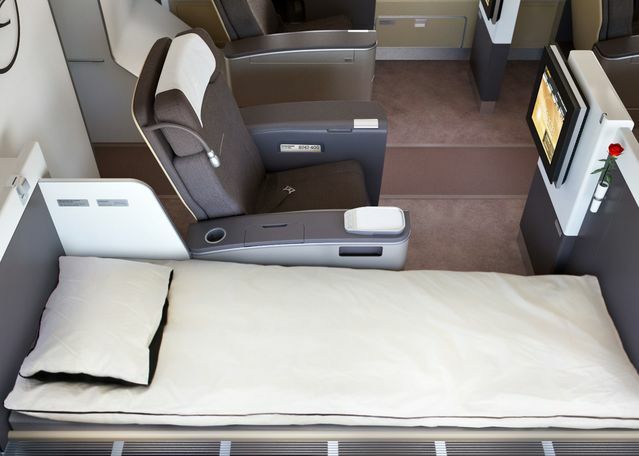 Business Class on Lufthansa’s A380 flagship has an angled lie-flat seat, which is somewhat surprising as flat beds in Business Class are becoming the industry standard. The airline has attributed its decision to stick with the angled lie-flat concept to the delayed A380 delivery, saying the design was appropriate when the aircraft orders were first made. However, Lufthansa reportedly plans to introduce flat-bed seats on its new B747-8 aircraft from late 2011 on, with other aircraft models to follow in coming years. 4 December 2010 | After a four-year suspension, Lufthansa has relaunched its FlyNet inflight Internet service on November 30, 2010. With the introduction, Lufthansa became the first airline to offer passengers wireless broadband Internet access on intercontinental routes. The airline is initially rolling out the FlyNet service on aircraft operating select North Atlantic routes, such as Frankfurt to New York, Detroit and Atlanta. Ten Lufthansa aircraft (mainly A330s) have been readied for the service so far. Lufthansa is offering the Ku-band satellite-based Internet service in partnership with Panasonic and mobile network operator T-Mobile. 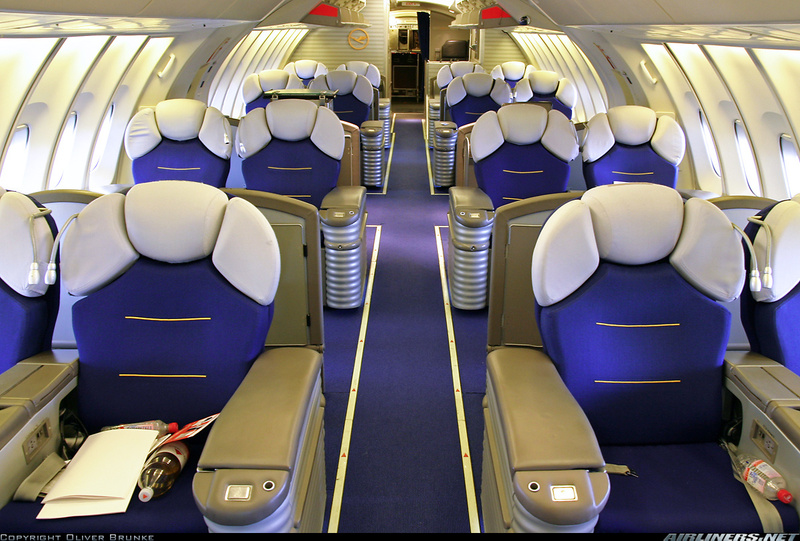 The airline will initially provide a WiFi Internet service for laptops and smartphones and GSM capability will be added in spring 2011. No voice or Skype calls will be permitted, however. “We got a clear message from our customers that they are seeking quietness on board and we respect this,” says Lufthansa vice president product management and innovation Christian Körfgen. Besides paid connectivity, passengers can also access news, sports and entertainment for free on an inflight wireless portal. 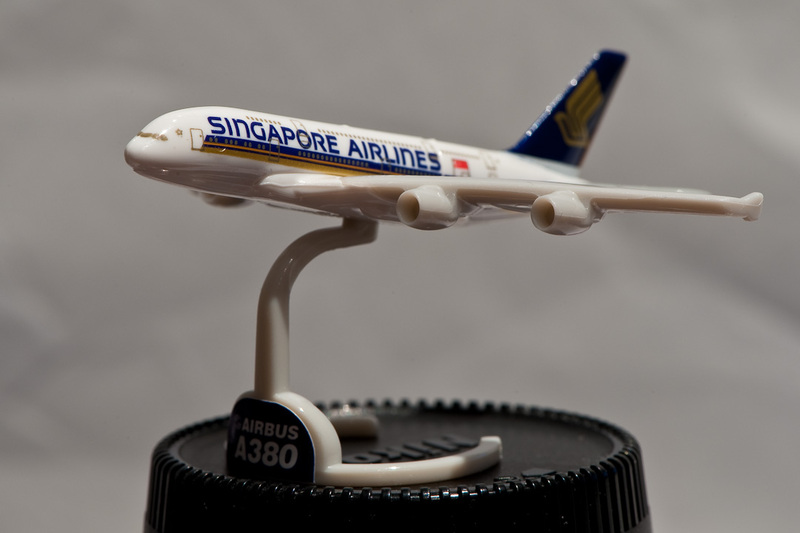 23 September 2010 | We recently covered the first airlines in Asia-Pacific (Air New Zealand) and the U.S. (Virgin America) that are using the fast growing location-based social networks Foursquare (3 million users) and Loopt (4 million) to connect with consumers. In Europe, Lufthansa has just become the first airline to partner with Foursquare for a geo-social marketing campaign based around the annual Oktoberfest in Munich, which takes place from September 19 to October 4, 2010. An important status element of Foursquare are ‘badges’, which are awarded to Foursquare members that ‘check in’ frequently with their cellphone at the same location. For example, the ‘Jetsetter’ badge can be earned by visiting an airport 5 times, and the ‘Airport’ badge can be earned by visiting 5 different airports. 29 April 2010 | Lufthansa will take delivery of its first A380 on May 19, 2010 and the first long-haul flight of the aircraft is to bring the German football team to Johannesburg on June 6 for the start of the FIFA World Cup. The airline then will introduce the A380 on scheduled routes from Frankfurt to Tokyo (June 11), Beijing (August 25), and Johannesburg (October 25). 12 October 2009 | Lufthansa USA has rolled out a new tool that lets air travelers share their location during their journeys via Twitter and Facebook. Called MySkyStatus, the application takes a user’s flight information, including departure and arrival data, and matches it to real-time global air traffic data. It then synchronises with their Facebook or Twitter page, posting regular updates about departure, arrival and even which country they are flying over. The messages also come with a link to a Google Maps mashup that shows their plane’s location. MySkyStatus users can choose whether to have only their departures and arrivals shared or also send messages (as often as hourly) with updates of their positions in the air. The MySkyStatus service is part of Lufthansa’s new marketing campaign ‘Passion for Precision’, and aims to back up the carrier’s reputation for punctuality. 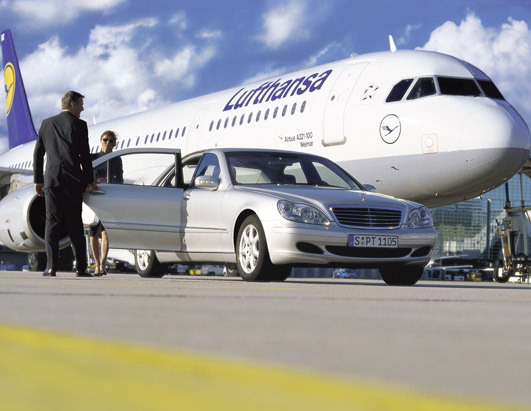 Passengers do not have to be travelling with Lufthansa to use the service. Every update is ‘lufthansa-branded’ (a short “powered by Lufthansa” is tacked on to every update), so those using the service for flights on other carriers will still be delivering some free promotion for Lufthansa.